Prime Minister Binali Yıldırım said late Saturday that Turkish ground offensive into northwestern Syria's Afrin will likely start on Sunday, depending on developments. Speaking to reporters with the Nationalist Movement Party (MHP) leader, Devlet Bahçeli, Yıldırım said that Turkish jets destroyed "almost all" terrorist targets they had identified belonging to the YPG. He said Turkish artillery would continuing to shell the region. "As of tomorrow, depending on developments, our ground elements will carry out the necessary activities," Yıldırım said. 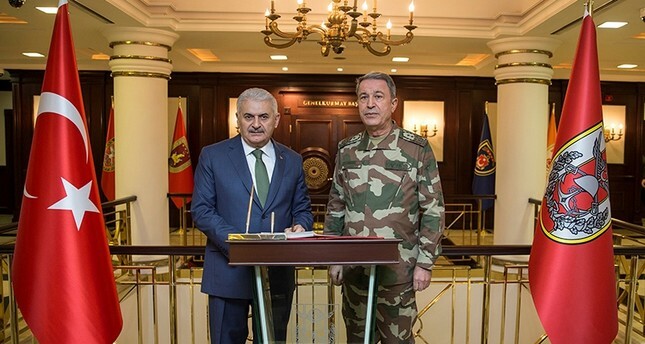 The prime minister also came together with Chief of General Staff Gen. Hulusi Akar at the Armed Forces' headquarters in Ankara to follow up and discuss the Operation Olive Branch. Some 72 Turkish warplanes participated in the Operation Olive Branch targeting seven regions in the counter-terror operation, the TSK said later, adding that the warplanes safely returned to their bases. Foreign Minister Mevlüt Çavuşoğlu confirmed on Saturday that both ground troops and F-16 warplanes were being used in Operation Olive Branch, underlining that o civilians were targeted and all current casualties were only YPG terrorists with uniforms. Yıldırım reiterated that Turkey decided to launch the operation after an increase in terror attacks on Turkish land from southeastern Syria. Turkey has launched a military campaign in Afrin region to eliminate the PKK, PYD, YPG and Daesh terrorist organizations, and to save civilians in the region from the terrorists' oppression and cruelty.